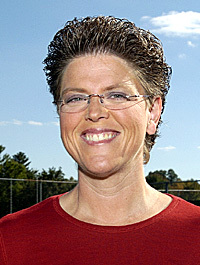 Cathy Jacobs enters her 16th season as Grove City College?s head women?s tennis coach. Jacobs has guided Grove City to 15 Presidents? Athletic Conference championships during her tenure as head coach. In that time, 14 Grove City players have earned the PAC?s Player of the Year award. Grove City won its 20th straight PAC crown in 2006, finishing the regular season with an 8-5 record. In 2005, Grove City athletes won all nine flights of competition at the PAC Championships in Erie, giving the Wolverines a perfect team score of 54. For her efforts, Jacobs earned the conference?s Coach of the Year award. She has now received the PAC?s Coach of the Year award eight times in her career. During the 2005 season, Jacobs directed Grove City to a program-record 13 victories. The Wolverines went 13-0 against NCAA Division III foes that year. Her overall won-loss record is 122-34 (.782). Of those 34 defeats, only nine have come against NCAA Division III opponents. She is currently second on the program?s all-time win list. Jacobs has led Grove City to 15 winning seasons since taking over as head coach in 1992. In 1996, she led Grove City to an undefeated 9-0 season after three straight 9-2 campaigns. Between 1998 and 2000, Grove City compiled an aggregate 31-4 record. A native of McComb, Miss., Jacobs joined the Grove City staff in 1988 as the College?s first head women?s swimming and diving coach. As head swimming coach, she has guided the Wolverines to six PAC championships. She has also coached numerous standouts in the pool, including three-time NCAA Division III national champion Peggy Whitbeck. Jacobs also coached the Grove City softball team from 1989-93. Grove City compiled 39 wins in that span, along with the 1990 PAC championship. She graduated from Delta State (Miss.) with a bachelor?s degree in health, physical education and recreation in 1983. She then added a master?s degree from Delta State three years later. Jacobs lives in Grove City.